신라 혜공왕 9년(733)에 법조가 영남사의 부속암자로 창건하였다고 전해지는 무봉사의 대웅전에 모셔진 높이 0.97m의 불상이다. 네모진 얼굴에 가는 눈과 입, 넓적한 코, 짧은 목 등이 다소 평판적으로 표현되기는 했으나 단정한 인상을 풍긴다. 어깨는 넓고 둥근 편으로 가슴이 다소 움츠러들어 보인다. 양 어깨에 걸쳐 입은 옷은 너무 두꺼워서 옷주름과 신체의 굴곡을 나타내지 못하고 있다. 부처의 몸에서 나오는 빛을 형상화한 광배(光背)는 2줄의 볼록한 선으로 머리광배와 몸광배를 구분하고, 그 안에 덩굴무늬와 연꽃무늬를 새겨 넣었다. 광배의 바깥부분에는 불꽃이 타오르는 모양을 섬세하게 묘사하고 있다. 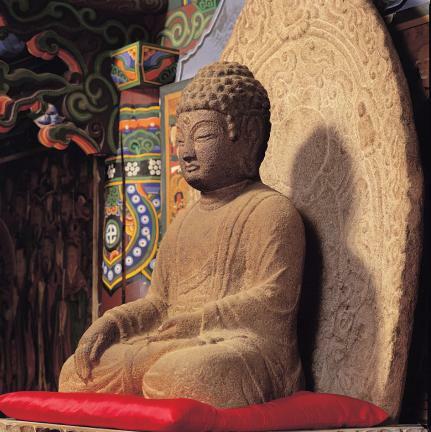 광배의 앞면에 5구의 작은 부처를 새겼으며, 뒷면에는 연꽃무늬 대좌(臺座) 위에 앉아 있는 약사여래를 조각하였다. 광배 뒷면에 불상이 새겨진 표현은 경주 남산 미륵곡 석조여래좌상(보물 제136호)과 같은 것으로 드문 예이다. 단정하고 양감있는 신체표현, 간략해진 옷주름, 화려하고 복잡해진 광배의 표현 등으로 볼 때 통일신라 후기에 만들어진 작품으로 보인다. 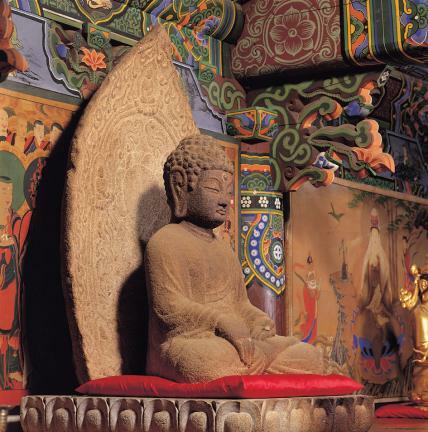 This stone seated Buddha, 0.97m in height, is enshrined in the Daeungjeon Hall (the main sanctuary) of Mubongsa Temple, which is said to have been founded as an annex to Yeongnamsa Temple by the Monk Beopjo in 733, the ninth year of the reign of King Hyegong of the Silla Dynasty. 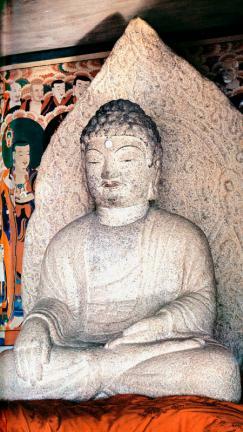 Although the statue has plain images of a square face, thin eyes and lips, a wide nose, and a short neck, it exudes a neat appearance. Broad, round shoulders make the chest look shrunken in comparison. 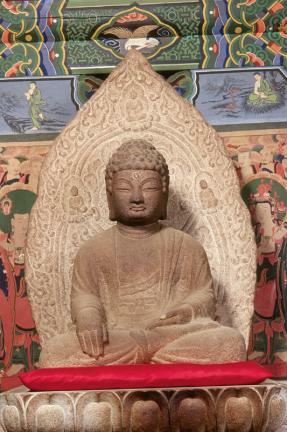 The Buddha’s beobui (sacerdotal robe), draped over both shoulders, is so thick that folds in the clothes and the shape of the body are not apparent. 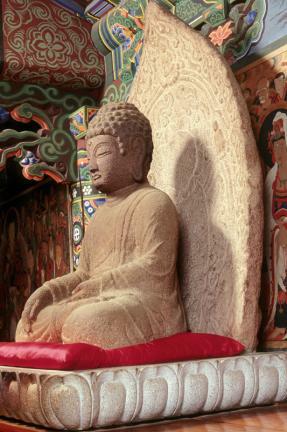 The mandorla (Buddhist halo of light) is made up of dugwang (light radiating from the head) behind the head and singwang (light emanating from the body), with a thick double line dividing them in two. The area inside the double line features patterns of vine and lotus flower, while outside, spark patterns are expressed in a sophisticated way. 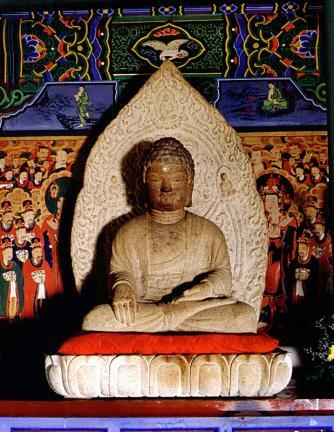 The front side of the mandorla is engraved with five small Buddha images, while the back side has an image of Bhaisajyaguru Buddha sitting on a lotus-patterned pedestal, something rarely found among examples of mandorla, but is the same style as the Stone Seated Buddha in Mireukgok Valley of Namsan Mountain, Gyeongju (Treasure No. 136). 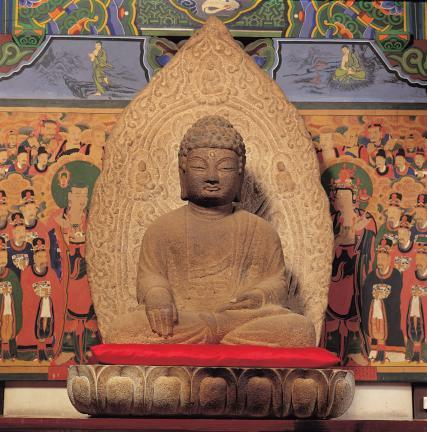 Judging from the body expression with its sense of neatness and volume, the simplified folds of the robe, and the splendid and complex expression of the mandorla, it is concluded that the statue was made during the late Unified Silla Period.